Great tamales are all about the masa. Masa for Tamales should be light, fluffy and full of flavor. I’ll show you everything you need to know about masa and which masa to use for your tamales, tortillas and other Mexican food favorites. Fresh Masa 101-Everything you need to know about fresh masa! “What is masa?” Hands down, that is the question I am most frequently asked. Masa plays a big role in both Southwest food and Mexican food so everyone wants to know more about it. What is it? How do you make it? What’s “fresh” masa? Can’t you just use the dried kind? What’s the difference between dried and fresh? OK, I admit it, masa can be rather confusing. That’s why I decided to do a post dedicated entirely to masa. Sort of a “Masa 101” post or an “Everything You Ever Wanted to Know About Masa But Were Afraid to Ask” post. That way, I can show you the types of masa side by side and you can see the differences for yourself. 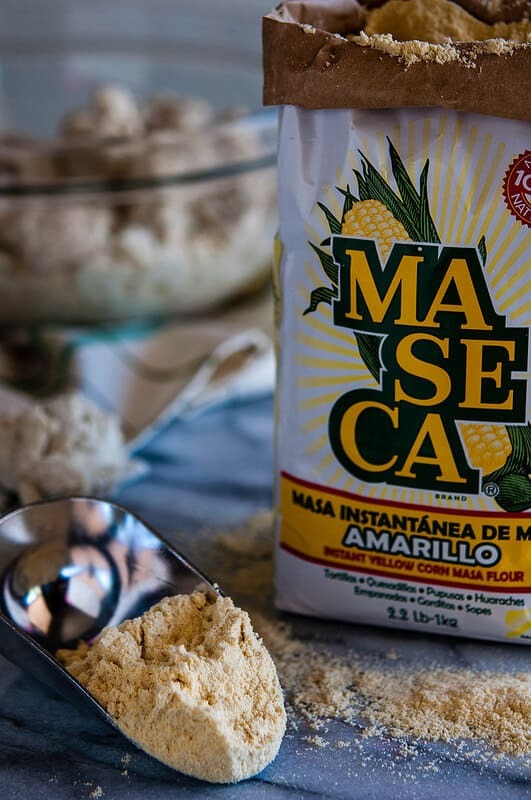 Masa is the dough made from corn that is the foundation of Latin American cooking. You will recognize it in the tamales and corn tortillas that are popular outside Latin America as well as lesser known dishes like arepas, pupusas and even empanadas and beverages. The uses for masa are just about endless. So, what is in masa? Corn. Yep. Corn. That’s it. Masa is made from corn that has been teated by an ancient Mayan secret called “nixtamalization.” To make a really long story very short, nixtamalization is the process of removing the outer “hull” of the corn kernel by drying field corn (or “dent” corn) then, soaking and boiling the corn in an alkaline solution of water, lime (calcium hydroxide, not the citrus fruit) and wood ash. Different indigenous peoples found different combinations of materials to achieve “nixtamalization” depending on which region they lived in. Nixtamalization has been used from the Incas in Peru to the Huron people of North America. But, that’s another post for another day. This is where the journey of masa begins. The processed corn can take two directons. 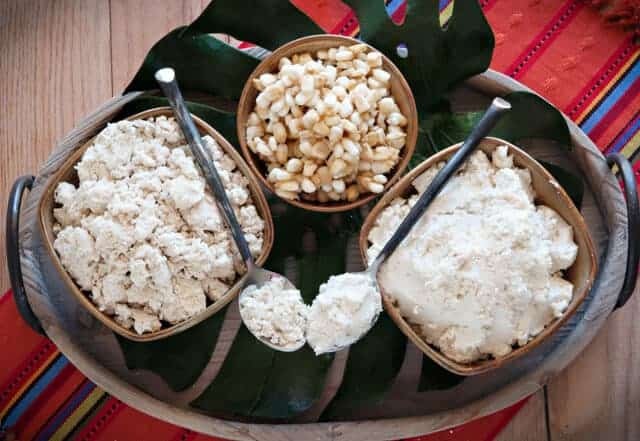 It can be ground into “masa” and either used “as is” for corn tortillas, arepas and pupusas or it can be mixed with lard to make masa for tamales. In the other direction, the nixtamal can be dried again and ground into a fine corn flour called “masa harina” or corn flour. Nixtamal –(in the center of the first picture in this post) Nixtamal looks like large, pale corn kernels. You can purchase nixtamal to grind your own fresh masa or use it in soups, pozoles or even beverages. Masa Sin Preparar or “Earth Without Preparing” (don’t you just love that translation? )-Masa Sin Preparar is plain, fresh masa. The nixtamal has been ground into a coarse masa (or dough) that is perfect for tamales but, it has no additional ingredients added. You can sometimes find it with salt. This is the type of masa I buy. Fresh, simple, ready for me to turn it into what ever I want. Read the label to be sure that there is nothing in the masa except corn, water and trace amounts of lime. NO lard. The texture should be like the spoonful on your left in the photo above, coarse and crumbly. Masa Preparar or “earth prepared”-This is masa that has been mixed with lard and salt and is ready to make tamales. I use the word “ready” quite loosely. 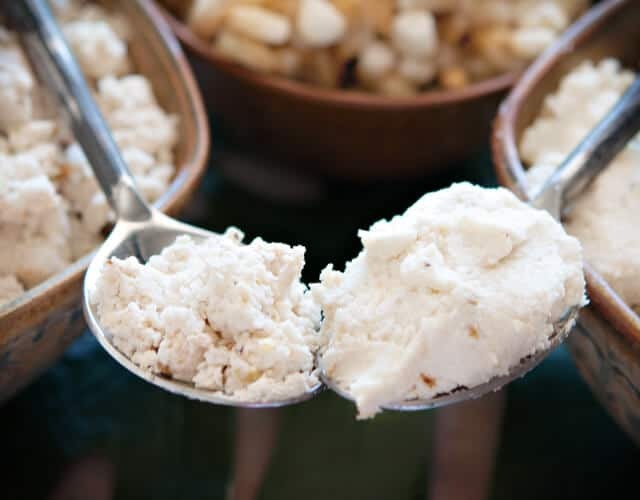 As you can see in the photo above, the masa preparar (on your right in the picture above) is a little creamier and smoother than the masa sin preparar but, it is usually too dense to use “as is” in tamales or similar dishes. The masa used for homemade tamales should be lighter and fluffier than most store bought masa and should resemble more of a frosting. If this prepared masa is all you can find, be sure to “lighten it up” by beating it with a mixer and testing it for consistency by dropping a small teaspoonful into a glass of water to see if it will float. If the masa does not float, whip in more lard and test again. Repeat this step until the masa is light and fluffy and floats in water. Masa Para Tortillas or masa for tortillas-This masa is ground much finer that masa for tamales. The Latin market I shop at uses fresh ground nixtamal for this as well. But, even if your market uses the dried masa harina, It is worth purchasing when making tortillas because there is no guessing about how much water to how much dried corn flour to use. Plus, it has “rested” and is ready to use as soon as you get home. The masa should be identified on the package as “para tamales” or “para tortillas” make sure you check to make sure. If it is not identified on the label, be sure to ask. Sometimes the textures are so close that reading the label is the only way to tell which masa you have. The masa is sold in plastic bags so that you can see the texture but, it has been stacked on top of each other which packs it together. Be sure to “fluff” up both types of fresh masa BEFORE using. You can make tamales and similar recipes from masa harina but, be sure to follow the directions on the back of the package for making tamales. The ratio of lard to masa harina will vary from brand to brand. Masa harina is the easiest masa to find and is carried by most regular grocery stores. You will usually find it on the Latin foods isle or where other specialty flours are kept. Maseca is the most common brand in my area. One of the best uses for masa harina is making corn tortillas and other “pastry type” doughs like empanadas. It it can be used in baking corn breads and even some cakes. It can also be used to thicken soups and stews. Add the recommended amount of water but reserve a few tablespoons. The dough may not need all of the water. The amount of water will vary depending on the humidity of the day and the freshness of the flour. The dough should have the consistency of sugar cookie dough. Add the remaining water if necessary. Allow the dough to sit and “rest” in order to absorb all of the water and loose some of the “flour-y” taste. Don’t forget the salt. Make a small “test” tortilla to cook and test for seasoning before you press out the batch of tortillas. The dough will keep for a day or two if you shape it into a log and turn it out onto a piece of plastic wrap. Roll it up in the plastic the way the same way you would for cookie dough. So, there it is, masa in a nutshell or corn husk or something like that. I hope I have helped you get an understanding of masa and the differences between the types of masa… even into the process of making the masa. Please let me know if you have other questions or if you think I wasn’t quite clear on something. I love hearing from you and would be happy to help in anyway. In fact, this post was a result of your questions. Here are links to a two of the masa recipes that we have on Everyday Southwest. 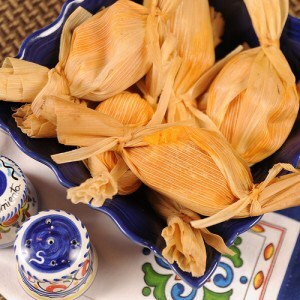 Mom’s Traditional Mexican Tamales are made with fresh masa (masa sin preparar) and the Chipotle Sweet Potato Tamales are made with dried masa harina. Be sure to sign up for our email updates so you won’t miss a single recipe or post! Just click on this link and enter your email address. You will be sent an email with a link to verify your free subscription so please click on it to complete your registration. I hope you will try making tamales with fresh masa. If you have any questions, please leave a comment here on this post or follow Everyday Southwest on Facebook. You can always leave me a message there. Thanks, Sandy, for this so helpful post. Too often we use terms that are so common to us that we forget that others may not be as familiar with the definitions. What a handy source of all things masa, Sandy. Thanks for putting it all in one post. I use masa harina for tortillas, tamales and thickener in pots of chili and never play with the fresh stuff. Now I’m tempted to experiment. Thanks for the education. I certainly get confused. I am yet to understand Mexican cuisine through and through. This was very helpful. Fabulous post! I’ve never bought fresh masa so I didn’t know much about it. Thanks! The fresh stone ground masa at TheMasaMan.com is buy far the best and possibly the only fresh masa ive ever tried. the difference between fresh and corn flour is unmistakable and i think the owner ships it online. Im just lucky enough to live 30 minutes away. Well worth the drive. Hi Terry, Thanks for stopping by the blog and for your great tip on where to buy fresh masa. I’ll have to order some and check it out, it sounds delicious! Bonding with your sister and making your mother’s amazing tamales is such a great way to remember her! I’m sending warm wishes to you and am glad to help with any questions you may have. If you would like, send a friend request to my personal Facebook account to make it easier to ask and answer questions. I Sandy thanks so much for the information on fresh and dry masa it can be very confusing. your tip help me.. I have a question? You said para tortillas is a finer masa and it can be used for tamales. Is the texture like masa harina dry corn flour? Because I want a fluffy melt in your mouth texture for my tamales. I used dry masa harina dry corn flour for few years now ready to try fresh.But it was so confusing to no the right one to buy. I like to use unprepared so I can add my ingredients myself. And prefer fine texture for fluffy tamales. Thank you so much. Hi Saiz, Good question, I think the masa para tortillas is finer but it does still have texture. Not exactly like masa harina. I like the unprepared masa, as well. the key to really fluffy tamales is beating the masa and lard together with a mixer so that it becomes fluffy—kind of like frosting. You can test the masa by dropping a small spoonful into water to see if it will float. If it does not float, add a little more lard and beat it again. I hope that helps! I’m sorry it took so long to answer, I just saw your comment, it was left while the new “make-over” on the website was still causing some problems. 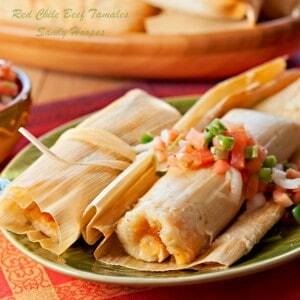 Have fun making tamales… sometimes the gathering together of family and friends to make them is the best part! Great information. I found your site by searching for information on storing fresh made masa. I buy the corn from an organic farmer and nixtamalize (a real word) the corn. There is no better tasting tortillas/tamales than that made with fresh masa. I love how easy you have made this. I live in a region where tamales are popular and I never knew there were so many varieties and so much to know! Off to check out my pantry to see what I’m actually working with! I was really surprised how easy this was to make. Finally I have got Tamales that taste like the ones I had whilst living in Central America. This post is packed with so much wonderful information about masa. I especially found the fresh masa buying tips very helpful. I will be ordering masa at a Mexican market this Christmas, so I’m so excited that I found this post as my handy reference guide. Thank you so much for sharing your expertise! This was such an easy to follow Recipe! Thanks for the clear instructions. HI Joyce! I’m so glad this was helpful. I usually by mine at the local Latin grocery store. There is usually a good one in most cities now, there is even one in my sister’s small-ish town in Utah. I did a quick Google search and found a link to latin food markets in Houston, here is the link. It is too late to call tonight but, I’m sure a few of them carry fresh masa. I had some masa harina and made cornbread. The texture and especially the flavor were off though. I on my tried it once. Hi DM, Thank you for your comment. I have never used masa carina for cornbread before. Masa harina is ground into a fine flour, do you think that could have made the difference in your cornbread? Thank you for this wonderful recipe. It is very close to my Nana’s. 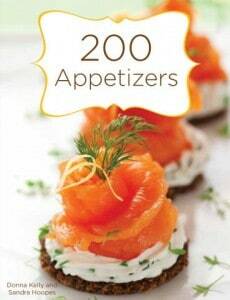 The olive was the cinch for me to try this recipe. There was always an olive in my Nana’s. I was born in Arizona but raised in Texas. The tamales in Texas are very different from home. It is nice to have this recipe. I do have a question. Will the tamales set with less baking powder? My Nana’s tamale masa seems to be much thinner when it is cooked. I smeared a very thin layer but it still seemed thicker than I remember. I wish I could find white corn fresh masa. All I have been able to find here is yellow masa. Thank you so much for sharing your family’s recipe. I am so pleased with it. I tried to get a recipe out of my Nana for years but she never measured anything so I had a lot of failed trials. She has since passed away. Tamales always remind me of her. I now have a recipe to continue to pass down to my family. Oh Anita! Thank you so much for your post. I am so glad that you love this recipe and that it reminds you of your Nana. These tamales have been a family favorite for decades and I hope they will be your favorite for a very long time. I have not tried this recipe with less baking powder but, I don’t see why they wouldn’t set with less. The baking powder helps with the “fluffiness” of the masa but it is such a small amount that the masa should set with less of it. If you try the tamales with less baking powder, please let me know how they turn out and if you like the result.